The Dolcetto d'Alba, Arsigà, which in the Piedmontese dialect means to take a risk, is born from the blend of Dolcetto grapes from various vineyards of the Batasiolo estates. 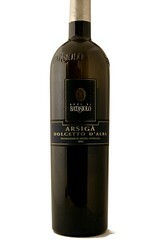 Arsigà has a deep ruby-red color with violet reflections; an intense fruity nose, with particular notes of morello fruit and under-tones of vanilla. The palate is full and envelopping with a well-balanced tannin and a long finish. Best served in the autumn, one year from the harvest, at a temperature of 17°- 18° C.